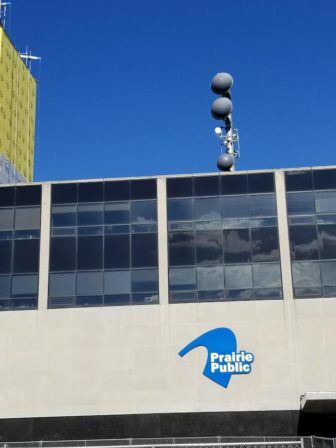 Prairie Public Broadcasting in Fargo, N.D., faces three potentially costly solutions to route its signal around a high-rise that will block its microwave transmitter. Prairie Public’s microwave transmitter is atop a monopole on its headquarters in Fargo. The 18-story Block 9 development, set to break ground within the next month, will interfere with a transmitter atop a 125-foot monopole behind Prairie Public’s downtown headquarters. The beam of the transmitter, which sends programming to an antenna in Wheatland, will be disrupted once the building hits 100 feet, about nine months after construction begins. It’s also a potentially expensive challenge for Prairie Public. The network faces three options: purchase a higher monopole for around $300,000; replace the transmitter with fiber-optic lines, which would cost about $580,000; or relocate the transmitter. Block 9 developers and Prairie Public issued a joint statement Thursday that they’re working toward a solution “within the next two weeks.” Both sides are reviewing an engineering consultant’s report that suggests long-term solutions. “We are all committed to resolving the problem and keeping the valued service of Prairie Public Broadcasting on the air,” the statement said. The statement comes after a public briefing this week turned contentious. According to local reports, dozens of public TV viewers packed the briefing to complain about the possible loss of programming. Several supporters demanded that developers pay for a fix, reported the West Fargo Pioneer. Harris said he was surprised by the outpouring of support, which the network did not organize. The $400,000 drop affects 13 full- and part-time positions.